Don’t forget to tune in tonight to part 2 of Jazz at the movies on BBC Radio 2 at 10pm. 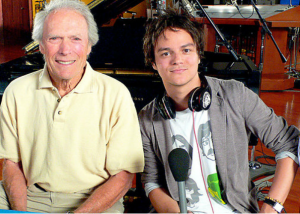 Jamie Cullum shares his love for jazz and the cinema. In the second of this two-part series, Jamie celebrates the work of some of his favourite directors and meets the man behind one of his favourite films. He talks to Clint Eastwood about rebuilding the music of Charlie Parker for his biographical film ‘Bird’; and to the legendary trumpeter Terence Blanchard about working with Spike Lee and teaching Denzel Washington how to hold a trumpet properly. He talks to a film critic who loves Woody Allen films almost as much as he does and meets the man behind one of his favourite films of all time – ‘The Fabulous Baker Boys’. And, thanks to the magic of radio, he finally achieves his life-long dream of singing with Michelle Pfeiffer.